On his arrival at Tocal in March 1822 James Webber began to clear the rainforest and plant his first crops. Agriculture at Tocal flourished under Webber, and by 1825 he had cleared 130 acres and planted wheat and maize. By 1829 he had cleared 300 acres. The number of horned cattle at Tocal rose from 130 in 1827 to 380 in 1830 to over 600 in 1834. Sheep numbers climbed from 1,300 in 1827 to 2,800 in 1830. By 1830 there were 34 convicts at Tocal assigned to James Webber along with three 'free servants', bringing the total workforce to 37. James Webber built up a high quality flock of sheep, tended by convict shepherds. At that time it was normal practice to wash sheep prior to shearing, to remove dust from the wool. There is the remains of a 'sheep wash' on Webbers Creek today which probably dates from Webber's time. 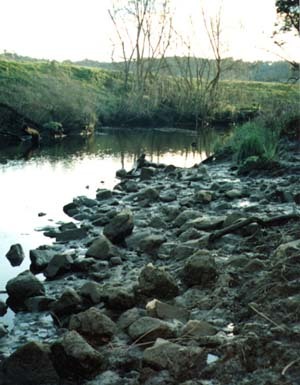 Right: the only pile of stones on Webber's Creek marks the remains of Tocal's sheep wash.
Tobacco was one of James Webber's main crops. In 1829 he had 25,000lbs of tobacco stored at Tocal and the following year there were 40,000lbs. In 1830 Webber built a stone barn which, among other things, was used to dry tobacco. The barn still stands at Tocal today. James Webber also had a dairy, pigs, orchard, vegetable garden and a vineyard. He was one of the pioneers of the wine industry in NSW (see next page for details). Above: an early photo of Webber's 1830 barn which was used to dry tobacco.